Hedge funds and large money managers usually invest with a focus on the long-term horizon and, therefore, short-lived dips on the charts, usually don’t make them change their opinion towards a company. This time it may be different. During the first 6 weeks of the fourth quarter we observed increased volatility and small-cap stocks underperformed the market. Hedge fund investor letters indicated that they are cutting their overall exposure, closing out some position and doubling down on others. Let’s take a look at the hedge fund sentiment towards SL Green Realty Corp (NYSE:SLG) to find out whether it was one of their high conviction long-term ideas. Hedge fund interest in SL Green Realty Corp (NYSE:SLG) shares was flat at the end of last quarter. This is usually a negative indicator. At the end of this article we will also compare SLG to other stocks including Energen Corporation (NYSE:EGN), Sensata Technologies Holding N.V. (NYSE:ST), and Servicemaster Global Holdings Inc (NYSE:SERV) to get a better sense of its popularity. The New York City-focused office landlord reported largely positive earnings recently, posting third-quarter funds from operations per share of $1.66, a year-over-year increase from $1.49. FFO attributable to company common stockholders came to $149.8 million, declining from $152.9 million in the year-ago period. On a negative note, the company faced a fall in its quarterly revenue numbers, logging $307.5 million down from $374.6 million. Meanwhile, the company is on a bit of a selling spree. In its third-quarter earnings release, SL Green said it is shedding its fee interest in 1231 Third Ave. and a portfolio in New York City’s Upper East Side neighborhood for an aggregate $143.8 million. To most investors, hedge funds are viewed as slow, old investment vehicles of years past. While there are over 8000 funds with their doors open at present, Our experts look at the leaders of this group, approximately 700 funds. It is estimated that this group of investors shepherd the lion’s share of the hedge fund industry’s total asset base, and by watching their highest performing stock picks, Insider Monkey has determined a number of investment strategies that have historically outrun the broader indices. Insider Monkey’s flagship hedge fund strategy beat the S&P 500 index by 6 percentage points per year since its inception in May 2014 through early November 2018. We were able to generate large returns even by identifying short candidates. Our portfolio of short stocks lost 26.1% since February 2017 even though the market was up nearly 19% during the same period. We just shared a list of 11 short targets in our latest quarterly update. Let’s take a look at the latest hedge fund action encompassing SL Green Realty Corp (NYSE:SLG). At the end of the third quarter, a total of 18 of the hedge funds tracked by Insider Monkey were long this stock, a change of 0% from the previous quarter. 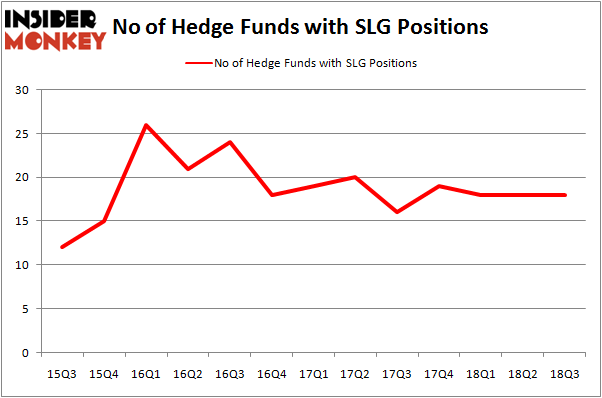 On the other hand, there were a total of 19 hedge funds with a bullish position in SLG at the beginning of this year. With the smart money’s positions undergoing their usual ebb and flow, there exists an “upper tier” of key hedge fund managers who were boosting their stakes considerably (or already accumulated large positions). The largest stake in SL Green Realty Corp (NYSE:SLG) was held by Renaissance Technologies, which reported holding $17.4 million worth of stock at the end of September. It was followed by Adage Capital Management with a $11.4 million position. Other investors bullish on the company included D E Shaw, Two Sigma Advisors, and Levin Capital Strategies. Due to the fact that SL Green Realty Corp (NYSE:SLG) has witnessed falling interest from the aggregate hedge fund industry, it’s safe to say that there exists a select few funds who sold off their positions entirely heading into Q3. 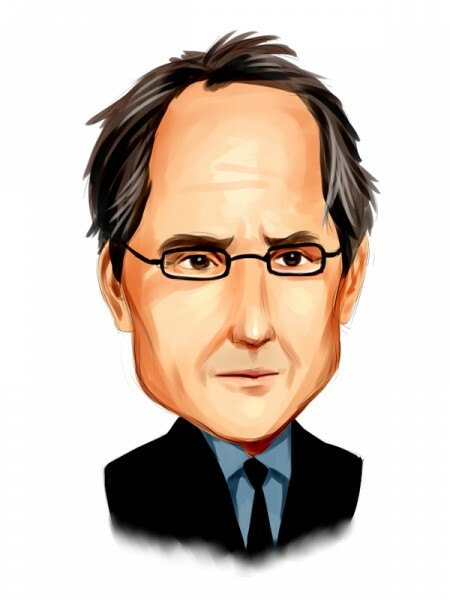 It’s worth mentioning that John Khoury’s Long Pond Capital dropped the biggest position of the 700 funds followed by Insider Monkey, totaling about $77.9 million in stock, and Paul Tudor Jones’s Tudor Investment Corp was right behind this move, as the fund said goodbye to about $1.4 million worth. These moves are important to note, as total hedge fund interest stayed the same (this is a bearish signal in our experience). Let’s also examine hedge fund activity in other stocks – not necessarily in the same industry as SL Green Realty Corp (NYSE:SLG) but similarly valued. We will take a look at Energen Corporation (NYSE:EGN), Sensata Technologies Holding PLC (NYSE:ST), Servicemaster Global Holdings Inc (NYSE:SERV), and Twilio Inc. (NYSE:TWLO). All of these stocks’ market caps resemble SLG’s market cap. As you can see these stocks had an average of 34.25 hedge funds with bullish positions and the average amount invested in these stocks was $1516 million. That figure was $80 million in SLG’s case. Twilio Inc. (NYSE:TWLO) is the most popular stock in this table. On the other hand Sensata Technologies Holding PLC (NYSE:ST) is the least popular one with only 26 bullish hedge fund positions. Compared to these stocks SL Green Realty Corp (NYSE:SLG) is even less popular than ST. Considering that hedge funds aren’t fond of this stock in relation to other companies analyzed in this article, it may be a good idea to analyze it in detail and understand why the smart money isn’t behind this stock. This isn’t necessarily bad news. Although it is possible that hedge funds may think the stock is overpriced and view the stock as a short candidate, they may not be very familiar with the bullish thesis. In either case more research is warranted.